Eligible students in Butler's Automotive Technology program now have the opportunity to become paid interns at local dealerships. Butler Community College is giving Automotive Technology students the opportunity to become paid interns at car dealerships in the area. Butler’s decision to partner with local dealerships will provide its students with real-world experiences. The college is collaborating with Scholfield Honda, Rusty Eck Ford, Davis Moore Lincoln and Parks Chevrolet of Augusta for these internships, with hopes to add more at a later date. This year, there are two students per dealership. Students will spend two weeks at each dealership to complete the eight week internship. 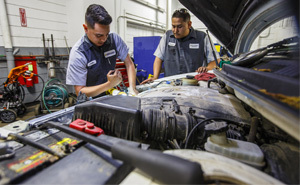 Butler’s Automotive Technology program offers students a one-year certificate or a two-year associate degree. Classes for the automotive program run from 7 a.m. to 1 p.m., five days a week. The internships will take place in the afternoon, following classes. “These internships help our students get hands-on training in the latest technology,” said Mark Jaye, automotive technology instructor at Butler. Butler Community College’s Automotive Technology program is accredited by the National Automotive Technicians Education Foundation (NATEF). Butler has maintained its NATEF accreditation for more than 15 years. For more information about our graduation rates, the median debt of students who completed the program, and other important information, please visit Butler’s website at, http://documents.butlercc.edu/gainful-employment/Auto-Technology/Gedt.html.